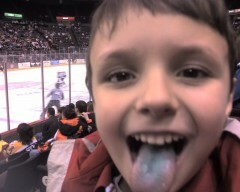 My son SM showing off his blue tonuge after enjoying some cotton candy at a Cyclones game last season. Enjoy some hockey and help teach your children about giving back! 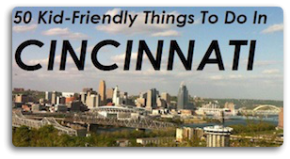 On Friday, Nov. 27 and again on Saturday, Dec. 26, the Cincinnati Cyclones will host a Kids Eat Free night. Children ages 2 to 12 who bring kid-friendly, nutritious food items to the game for donation to the FreestoreFoodbank will receive a voucher for a free kid’s meal containing a John Morrell Hot Dog, bag of Grippo’s chips and a beverage.